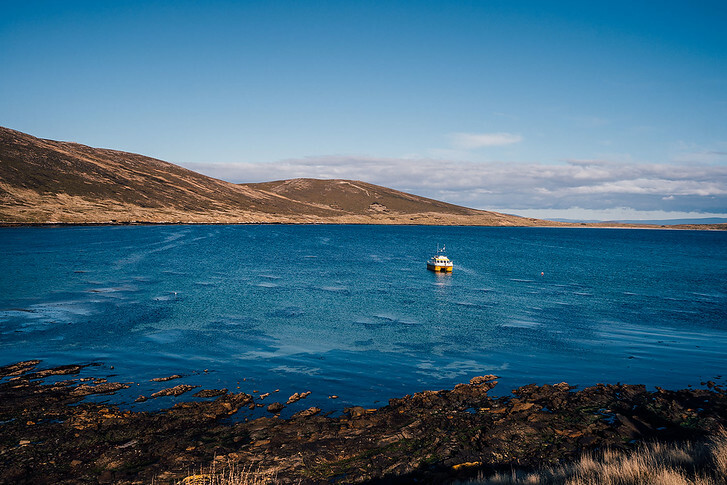 9 Beautiful Places in the Falklands to See Penguins, Seals & More! The first leg of our Antarctic cruise overflowed with anticipation. Even though we boarded in Puerto Madryn (Chubut Province, Argentina) on an unusually warm Sunday in October, we would have to wait until the following Wednesday to make our first “landing” in the Falkland Islands. To be honest, these two-and-a-half days at sea were the perfect amount of time to explore our beautiful vessel, the M/V Sea Spirit, make last-minute checks of our Antarctic packing list (coming soon), and listen to engaging lectures on what to expect during our voyage. I know, but trust me – these ones are worth it! The Poseidon Adventures Expedition team is composed of an international crew with advanced degrees in fields like biology, geography, geology, etc – One was even a multi lingual former merchant mariner! 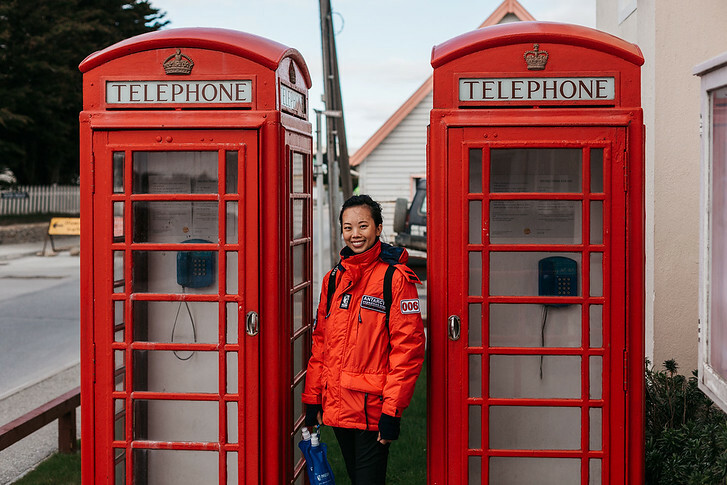 As a result, our days at sea were full of fascinating lectures covering topics as far-ranging as Antarctic wildlife, world history, and proper protocol when boarding Zodiac boats! 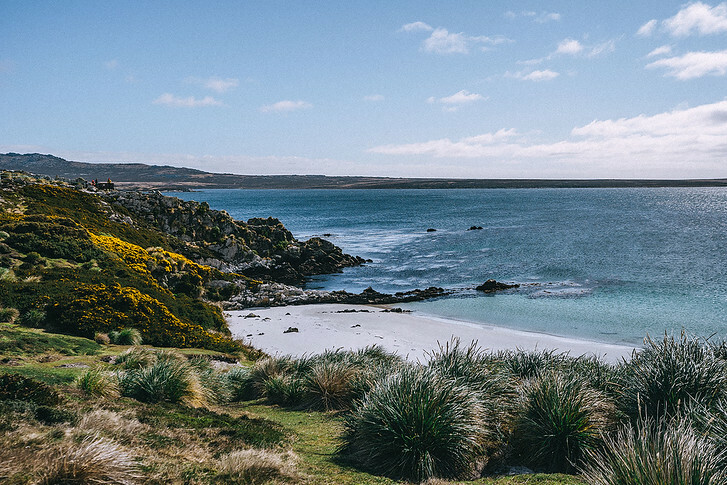 Located roughly 300 nautical miles east of Tierra Del Fuego, Argentina, the Falkland Islands are divided by the Falkland Sound into two large island masses named, simply enough, West and East Falkland. On that much, everyone can agree. The history of the Falkland Islands, however, is notable for its disputed and slow-developing nature. 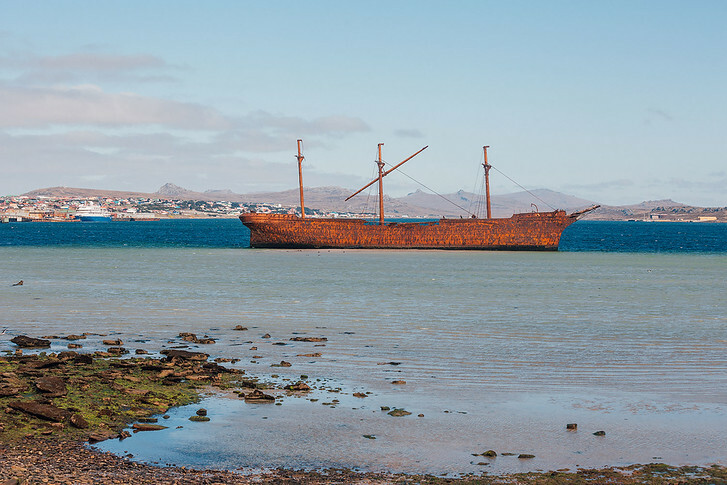 Written accounts suggest the Falkland Islands were first sighted in the early 16th century, perhaps as early as 1520 following a voyage by famed Portuguese explorer Ferdinand Magellan. Despite this early sighting, the first documented landing on the Falklands didn’t take place until over 100 years later, when British captain John Strong and his vessel Welfare landed in 1690 to form an early settlement. Captain Strong is credited with giving the Falkland Islands its name – in honor of the First Lord of the Admiralty, Viscount Falkland. The next 150 years or so were remarkably unstable for the Falkland Islands as the English, French, Spanish, Argentines (whose country was then known as the United Provinces of the Rio de la Plata), and American whaling ships variously laid claim to political or, in the case of the whalers, de facto control of the Falklands. In fact, for 10 months in 1765, the British and French were developing settlements on opposite sides of the country and had each declared sovereignty of the Falkland Islands… with complete ignorance of the other’s existence! Talk about a remote place. Eventually, the other imperialist nations became less enthusiastic about the long term prospects of their respective settlements, and the British seized their moment. In 1833, the Brits officially declared the Falkland Islands a British territory. Unfortunately, the Falkland Islands are infamous for the 1982 Falklands War between the United Kingdom and Argentina. Precipitated by Argentina’s dispute of the United Kingdom’s long-standing claim to the Falkland Islands territory, this 10-week war claimed over 900 lives and injured more than 2,000. Today, the Falkland Islands are still British territories. Politically stable, they’re a famous breeding ground for various Antarctic bird and marine mammal species. Both of these factors were on full and brilliant display during our voyage’s landings. In total, our cruise gave us 2 full days to explore the Falklands, with landings to various sights around both East and West Falklands. Keep reading for more about our visit! 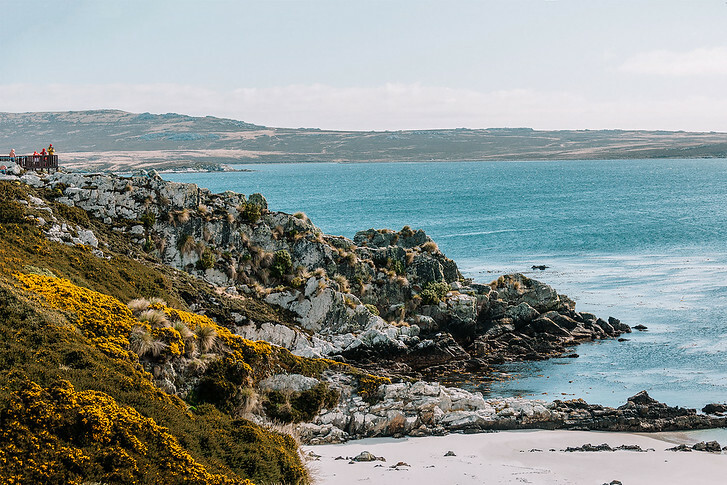 Following two-and-a-half days facing only the open ocean, waking up surrounded by the sweeping Falkland’s landscape felt surreal. After rushing through breakfast, filling our water bottles, and donning our Poseidon Expeditions-provided parkas for the first time, we were on our inflatable Zodiac boat, speeding away to West Point Island. On the dockside of West Point Island was the estate of the only permanent inhabitants of West Point Island, a husband-and-wife team who operate a large sheep farm. Generous promises of tea and crumpets at the sheep farmers’ residence were made – but would only be kept after the 1.5-mile, mostly uphill hike to the far side of the island! Quick side note: our hosts graciously offered to shuttle guests in their Land Rover Defender, but C, in a particularly uncharacteristic moment, decided we preferred the physical toll associated with the hike! After about 20 minutes, we had seen a handful of birds, a distant collection of several sheep, and hadn’t even reached the hill’s crest. I’ll admit that I began wondering whether the pictures we saw during lectures were the closest we’d get to seeing the mythical Antarctic wildlife. Then, when I saw the clusters of red parkas stop moving, I knew we were in for something special. Just over the ridge, we saw them: hundreds if not thousands of rockhopper penguins and black-browed albatrosses huddled together in an area smaller than a basketball court. Though both had arrived to the Falklands for its rich breeding grounds, the rockhopper penguins and black-browed albatrosses could not have been more delightful in their contrast. 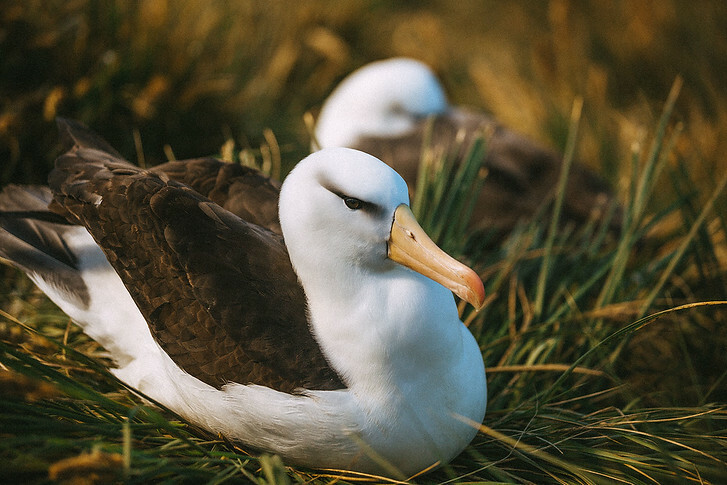 Larger than their penguin counterparts, the black-browed albatrosses were quiet sentinels of the breeding grounds, breaking their graceful perch only occasionally to squawk at each other or, more probably, one of the rockhopper penguins. Speaking of these little devils, the rockhopper penguins, as their name suggests, mostly got around by adorably hopping from rock to rock. Compared to the albatrosses, the rockhopper penguins were much more active, often socializing (and occasionally fighting!) with each other in large groups. Over 70% of the world’s black browed albatross breed here around the Falkland Islands. They’re true sea birds, magnificent in flight. 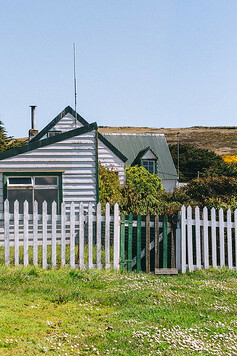 West Point and Saunders Island are two unique locations in the Falklands to see them up close. Probably 45 minutes passed us in awestruck silence before we realized we might miss the last Zodiac at 12:30pm. 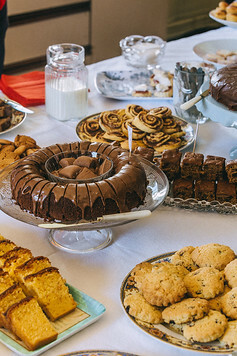 We rushed down the hill, stopped in our hosts’ beautiful home for tea and cakes (the fudge brownies, lemon squares, and madeleines were our favorites among the several dozen options! ), acknowledged the distinctly unique weekly to-do list of sheep farmers (Monday: Look for new sheep; Saturday: Kill mutton), and rushed to the partially submerged docks to catch the last Zodiac back to the Sea Spirit. We had not just survived our first landing. We had loved every second of it. 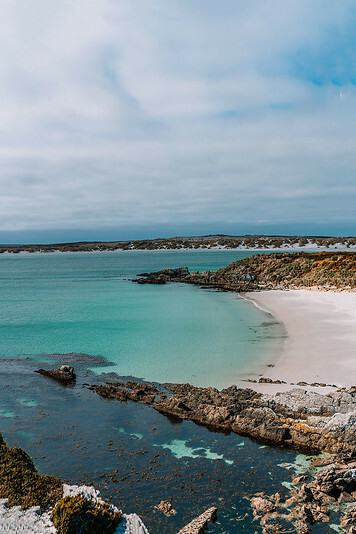 Carcass Island is often declared the most beautiful place of the Falkland Islands. With its stunning blue bays, abundant penguins and sweeping vistas, it certainly didn’t disappoint! After a quick lunch and shower back aboard the Sea Spirit, we began making our short journey northwest to Carcass Island, named for the discovering vessel that found this island in the northwest archipelago of West Falkland. Our landing on Carcass Island was quite different than our arrival on the West Point docks. First, there were no docks to greet us upon our arrival at the island’s southern coast – just a glistening white sand beach that evoked the tropics more than it did the remote Southern Hemisphere. This meant our first experience with a “wet landing” aboard the Sea Spirit. Luckily, Poseidon Expeditions loans all guests waterproof Muck boots for the entire voyage. A few splashes and several paces later, we were already ashore, climbing our way through the dunes to the beach on the island’s northern coast. We had only to walk through the dunes for several seconds before stumbling on two large penguin rookeries, as groups of penguins are known. Each rookery was composed of roughly one hundred Magellanic and gentoo penguins. Both species are medium-sized Penguins, but the Magellanic – with their exclusively black-and-white outer layer – evoked the mysterious Antarctic slightly more than their gentoo counterparts, whose bright oranges and reds rendered them familiar to mental images of the typical penguin. Because the rookeries were nestled between two nearby beaches (compared with the rookery of West Point, which was perched atop a steep cliff), we were able to more closely examine a range of penguin behaviors. These included diving into the ocean, swimming ashore, marching / waddling back to the rookery, and burrowing for warmth and shelter. I could’ve watched the adorable penguins for hours, but we had a 2.5-mile trek before reaching the pick-up point for the Zodiacs that would shuttle us back to our vessel. 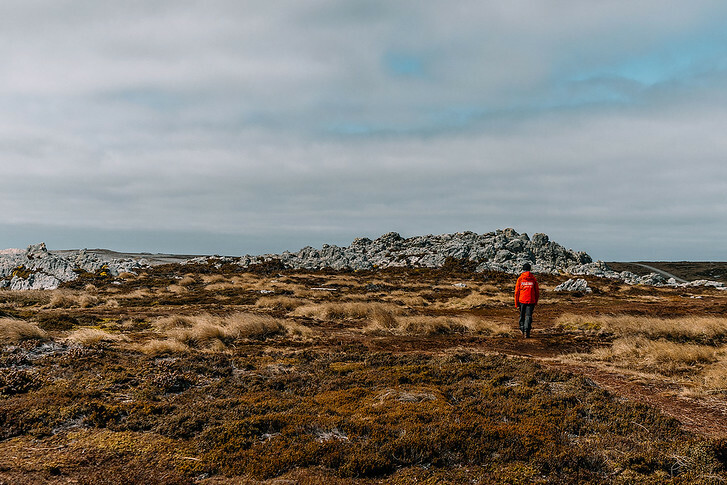 The Falklands is also perfect for avid hikers, as the scenery is incredible! Once again, C, who was starting to fashion himself quite the Ironman, decided to take the “no pain, no gain” approach to our first day of landing, signing us up for the more grueling hiking option! With that said, our hike along the southern coastline of Carcass Island was lovely. The high ground provided gorgeous shots of the bay, our vessel, and the two beaches lying in our rear view. Walking along the beach, meanwhile, offered stunning shots of some striated caracara birds, Falkland steamer ducks, and even various bones and skeletal formations – a somber yet sterling reminder that the Antarctic region is usually as remote as it is well-preserved. With two landings in our pockets, we already felt like seasoned pros. Next up? 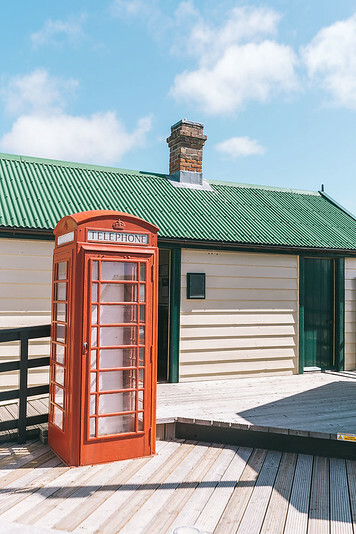 East Falkland and Port Stanley, the capital of the Falkland Islands! Stanley is the capital of the Falkland Islands, and visually quite different from our other landings. This weathered port town is “well populated” in contrast to West Point and Carcass Island – with over 2,000 local inhabitants. Originally settled in the mid 1800s, Stanley was an important settlement for English whalers and explorers. In fact, walking around Downtown Stanley felt much like we were transported to London, with the robin red phone booths, English pubs and British accents! While there’s not all that much to do in Stanley, the town has a number of sites of historical significance. It’s also the last well stocked landing, so if you want to hop on the internet, stock up on snacks or grab last minute toiletries, Stanley is your best bet! From here on out, we were headed to South Georgia and Antarctica. A pretty red and brown cathedral is one of the most iconic locations in Stanley. Right in front are two enormous curved jawbones, constructed in 1933 from two blue whales. The Whale Bone Arch commemorated over 100 years of British administration and the town’s early beginnings. The jawbones form an arch 21 feet high, but are even larger than that! The lower 3 feet of each bone is planted deep into the ground and each weigh over half a ton. It took 8 men just to turn each bone over. Today, it’s one of the most photographed places in Stanley (try lining the arch over the church in your shot) and also a favorite spot for wedding photos. From the church, we continued down Main Street, stopping in local souvenir shops and pausing to read the war memorials dotting the waterfront. Don’t miss Kay’s, a whimsical local bed & breakfast with a cute and more lighthearted gnome garden. A can’t miss, the Historic Dockyard Museum tells the full history of the Falklands. In the main building, the museum chronicles the Falkland Island’s beginnings as a whaling settlement, with taxidermy of local birdlife. Downstairs are exhibits dedicated to the 1982 Falklands War, with first person accounts of what it was like for families on the island to live through the short, devastating battles. There’s also some side galleries covering the history of Antarctic exploration as well as smaller buildings outside, preserving a smithy, telephone exchange and storehouse from the 19th century. Not far away from Stanley is an idyllic beach that from a postcard, could be mistaken for the Caribbean. About a 20 minute car ride or 90 minute walk from Stanley, Gypsy Cove is home to penguins and lots of birds! Here you’ll find rock cormorants, steamer ducks, oyster catchers, black crowned night herons… and penguins! 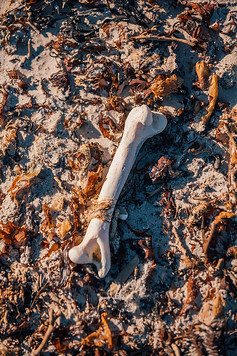 The beach itself is off limits, due to undiscovered landmines left after the Falklands war. Magellanic penguins luckily, are light enough that they don’t set off the mines. Instead, they’ve made the soft earth of Yorke Bay their home and if you’re quiet, you can find them all over the hills. We followed the signposted walk around Gypsy Cove, which led us in a meandering path overlooking the beach with several fantastic viewing platforms. If you choose to walk back, you’ll come across a second cove called Whalebone Cove. Here, the shipwrecked Lady Elizabeth is a rusty sight just off the shoreline. Alternatively, you can head east towards another pristine beach. 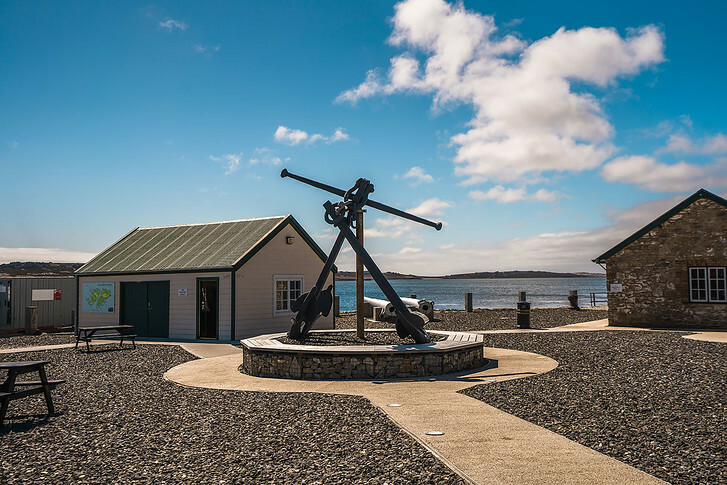 Cape Pembroke maintains a memorial to the Atlantic Conveyer as tribute to those who lost their lives when the ship sank during the Falklands War. Sea Lion is a National Nature Reserve and a paradise for wildlife. 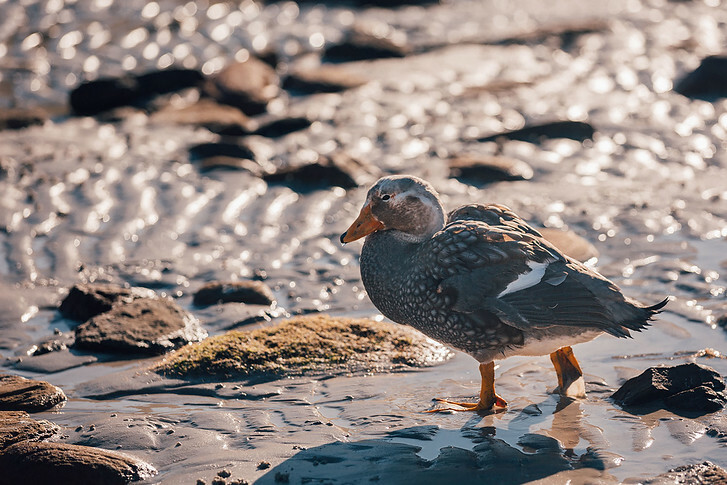 From the lodge, you’ll nearly stumble into rockhopper and gentoo penguins, along with elephant seals, sea lions and other birds who call the tussock grass and beach home. 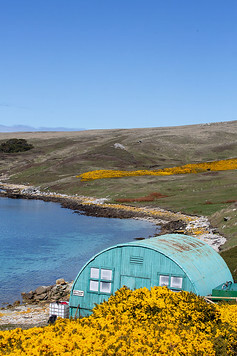 Weddell is another large island off the Falklands with pretty sandy bays and rocky coves. 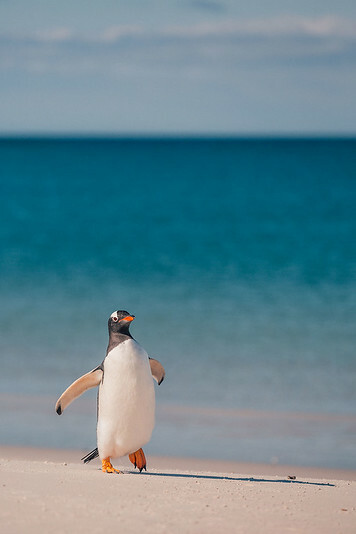 On a walk, you’re likely to find gentoo penguins, petrels and hawks. This large island is well known for its hiking opportunities and fascinating war history. Spot rockhopper penguins, sea lions, and beach comb the longest beach in the Falklands, at over 4 miles long! Saunders is famous for its ruins of the first British settlement. Today on the large island, you can find king penguins, rockhopper penguins, black-browed albatross and other fantastic bird life. This low lying island is perfect for those who want an easy walk. 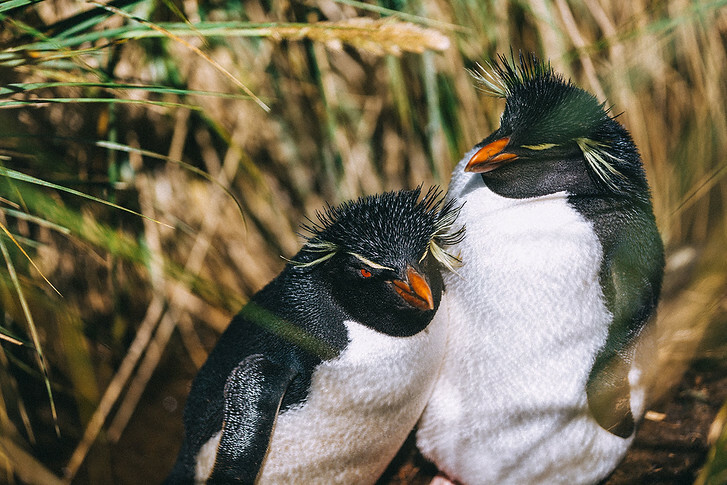 With rockhopper penguins, gentoo penguins, skuas, black headed swans and snowy sheathbills, bird lovers will find lots to love! 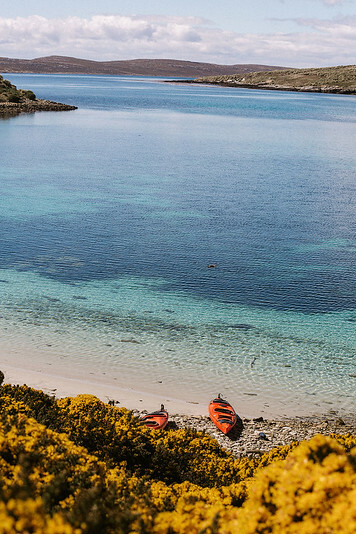 The best way to see the Falklands is via cruise. 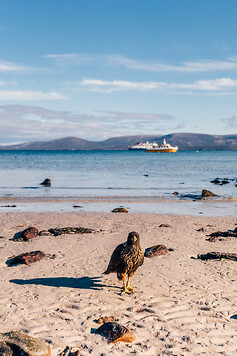 As the country is split into two halves, named simply East and West Falklands, a cruise provides flexibility to tour around the island and see its fantastic wildlife. Much of the breeding areas which the penguins favor are on private land. 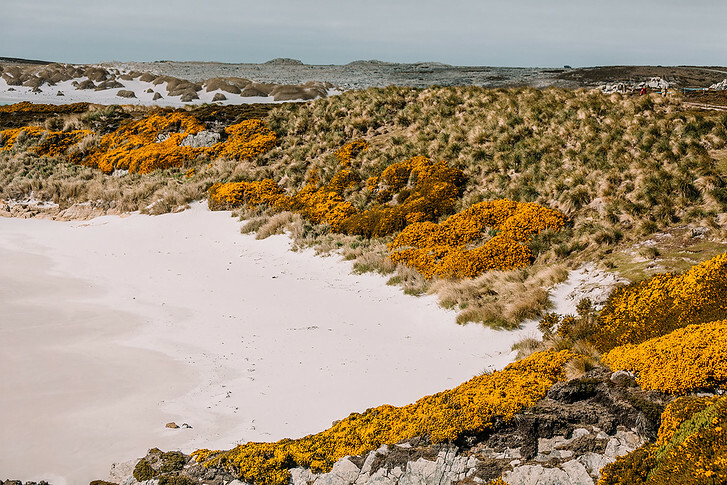 Cruise companies have relationships with the Falklands farmers, and that was how we were able to see the Rockhopper nesting grounds at West Point. Most Antarctica expedition companies will offer cruises to the Falklands as either part of a longer trip to Antarctica or combined with a trip to neighboring South Georgia. We flew into Argentina and joined a 20 day Poseidon Expeditions cruise covering the Falklands, South Georgia and Antarctica. Alternatively, you can fly into the capital. Flights from South America are a infrequent, so check schedules and book in advance. LATAM offers one flight per week on Saturdays, connecting Chile (Santiago or Punto Arenas) and the Falklands. One a month, on Saturdays, LATAM offers a flight from Rio Gallego, Argentina. In 2019, a new flight route from Sao Paolo, Brazil to Stanley will start, and once a month this route will connect stopover in Cordoba, Argentina. Our visit to the Falklands was fantastic! Next up, South Georgia! 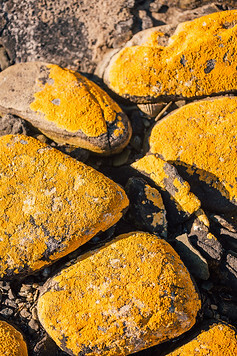 We explored both the Falklands and South Georgia on a cruise with Poseidon Expeditions. Expedition cruising is unique – landings depend on wind and wave levels so every trip is different! 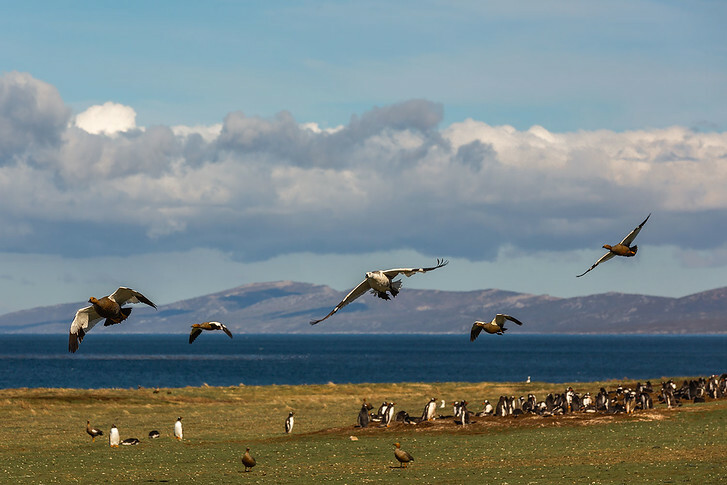 On our voyage, we had the opportunity to land at beautiful, remote sites on both East and West Falkland and see penguins, seals and bird life up close. If you’re interested in booking an Antarctic cruise, Poseidon is offering our readers up to a 15% off discount on select voyages. Email us for more info! Getting Around | The Falklands is a remote place. Since we explored via cruise, our transportation and accommodation were taken care of in style. If exploring on your own, you can book helicopter service or airfare on the national carrier FIGAS. Insurance | You don’t want to risk injury in one of the most remote places of the world! Airlifts to a hospital from the Antarctic can cost a fortune, so it is mandatory to purchase travel insurance of least $200,000 for expedition cruising. Luckily, we didn’t have any incidents but better to be safe than sorry! Get a quote for your trip here. Antarctica VLOG: A Day at Sea on Board an Expedition Cruise! 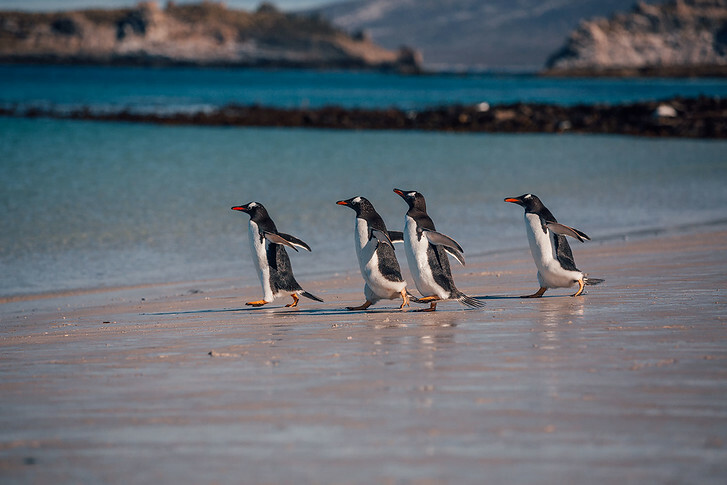 5 Penguins You'll Discover in the Falklands! Hi, excellent summary,thanks. Just one quibble – flights to/from Argentina are not banned. There is one per month to Rio Gallegos and another is planned via Cordoba on the way to Sao Paulo. Oops you’re right – thanks for the tip!